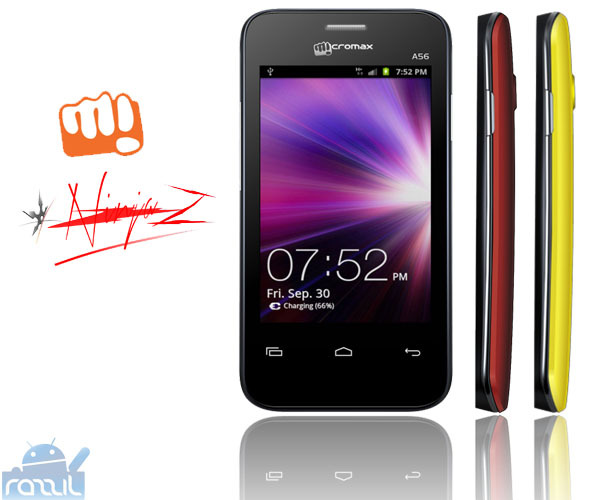 Micromax announced the new Android powered phone name “SUPERFONE NINJA 2”. Micromax Superfone NINJA2 has 800 MHz Qualcomm Processor, 3.5-inch full capacitive touch screen with the resolution of 320 x 480, 256 MB of RAM and it runs on Android 2.3 Gingerbread. The phone support dual SIM (GSM-WCDMA) and 1400 mAh battery which gives 4.5 hours of Talk time and 180 hours of stand by time. When it comes to memory the phone has 512 MB of ROM and support up to 32 GB of expandable memory. 256 MB of RAM is very low and it may affect the phone performance. The phone comes with 3 MP fixed focus camera. Micromaxx SUPERFONE NINJA2 will cost you Rs. 5999 which is pretty nice for this kind of specs and you’ll also get 2 color Back panels. The phone comes with many pre-loaded apps such as AISHA, Mi-SMS, Mi-Buddy, Facebook, TOI (Times of India), Whatsapp and Polaris Office.